Caroll “CJ” Hatcher is a candidate for the White Hall seat on the Albemarle County School Board. Five of the seven seats on board will be determined in the Nov. 3 election. Other candidates in this race include: David Oberg. Each candidate was interviewed by Charlottesville Tomorrow and asked 10 questions about their qualifications, priorities and important education issues. Included in the box at the right are links to the full transcript and audio recording of those interviews (also available on iTunes). 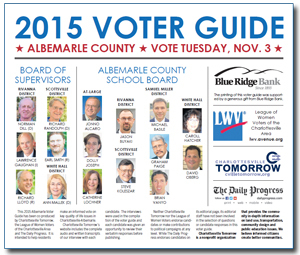 Highlights of all the candidate responses are available in this downloadable 2015 Voter Guide. The biographical information below is provided by each candidate. Bio: After graduating college, CJ Hatcher taught high school for ten years, serving as Department Head and representing her district on the powerful Texas State Textbook Committee. Later, as Director of Education for a large media company, she created award-winning curriculum materials (K-12), meeting state standards. Gaining national attention for her work, CJ started a successful educational publishing company – a leader in the niche industry for 25 years. She has personally authored 33 books for classroom use. Having lived all over the country, CJ and her late husband Tom moved to the area to be near their grandkids. A Virginian by choice, she has made Albemarle County her home. Family: Married for 26 years to the late Thomas Y. Hatcher (family roots in Southwest Virginia). One son, daughter-in-law, and two grandsons who attend Albemarle High School.